You just hit on my biggest gripe with a lot of Sci-Fi stories. So many of them include Aliens invading Earth for resources. Which makes no sense, as all the resources on Earth can be found in greater abundance elsewhere without the need of invading anything. Why would they travel so far, for so long, just to skip all the resource rich celestial bodies and attack us? Battle: LA said it was for liquid water, because supposedly Earth is the only place with water in a fluid state. Which makes no sense. Those aliens can detect Earth from light years away, but they can't find a comet? They can predict where Earth will be and when, but they can't perform simple fusion? Creating water is really easy, we do it here in hydrogen fuel cells but these super advanced aliens seem to have missed that somehow? Gah! It drives me absolutely insane! I think you're right about the science fantasy part. They aren't writing Science Fiction because they're passionate about it, they're doing it because they think it's easy and will make them rich. They think science fiction is just a story set in space where anything is possible. Look at Star Wars, it started as a story about swashbuckling space pirates with no reasoning behind anything that was going on. There were no "rules" to follow. They had lasers that could be deflected(meaning the Jedi could move faster than the speed of light), and lightsabers that made no sense if they were just made of light. But now, you've had passionate people go in a dissect the problems, and then apply reasonable solutions as to how and why they exist. The lightsabers are no longer made of lasers, but shielded plasma manipulated by magnetic fields to bend back in on itself. They've even explained why lightsabers hum, and what causes the snap-hiss when they ignite. That's what makes a story good. I don't care what the back ground is, what the setting is, or what universe the story takes place in. I absolutely NEED continuity and logic to enjoy the story. Which is why I hate Quantum Physics lol. Re: What makes good sci-fi? I split these two out into a new topic. Couple others could have come too, but I felt they applied to the original thread more. Anyway. One thing I've seen is the aliens want earth for the humans. Warriors, food, breeding stock, tribble cannon operators, what have you. Haha now everybody is gonna think I'm crazy for arguing with myself. I'll go into some detail about my thoughts on the subject in the morning. I'd do it now but I've got a ton of work to do. Aurora is a wonderful tool for procrastination. Just 5 more days and I'm done, I just need to get this research project completed and then I'll stop. Good sci-fi explores what hypothetically could be, the consequences thereof, and encourages us to imagine. Very good sic-fi focuses on possibilities and consequences following a single technological advance or event. In any case, internal consistency is critical. By this definition George Orwell's 1984 is science fiction. While not the most enjoyable read, it is somewhat famous for making readers think, dream - or fear. Kiln People explores "What if people could make temporary duplicates of themselves?" Lady of Mazes explores what if virtual reality became so immersive it was (almost) indistinguishable from true reality. Rendezvous with Rama and the Ring world books encourages us to think about building bigger. "What if Aliens came here?" was one of the classic possibilities explored, but the best works were written decades ago, such as War of the Worlds, back before we sent space probes ourselves to all the local planets. Today a good alien story requires our motivation for going interstellar distances to them, or their motivation for coming across interstellar distances to us. Space Opera can be an enjoyable read and is popular in war stories for the alternative battle ground it provides, but Space Opera depends on strong writing and character development to keep a science fiction enthusiast from looking too closely at any setting inconsistencies. If I'm going to have aliens in my science fiction, I want them to be alien. Really out there, you know? It always bugs me when aliens are basically humans, but green or with horns or head tentacles or whatever. It bugs me when we're even able to understand, let alone communicate with, each other. Examples of bad aliens: Star Trek, Star Wars, Titan A.E., Farscape, etc. Examples of good aliens: Alien, Sphere, Predator, the H.P. Lovecraft mythology, etc. For me, aliens must make sense. There has to be a reason they are the way they are. Humans evolved to fit Earth, and I imagine aliens would evolve to fit their homeworld. I don't like when aliens are portrayed as overly Human, but I don't like when they portray them as monsters either. Intelligent life is likely going to be more similar to us than it is different. They will likely be a social species, with some form of communication and a structured society. It's likely they will use verbal communication, as that's a much more effective means of communicating over long distances. Hormones, bio-luminescence and other non-verbal communication methods are great for conveying meaning across very short distances but imagine, however, if you were trying to tell a friend when it's safe to cross a busy street using only a spray bottle filled with a specific perfume. It'd be nearly impossible, as the scent would be blown away before it ever reached them. Now imagine trying the same task with a flash light, at noon, without a cloud in the sky. Yelling at them is much easier. Will their speech be something we could mimic? Maybe, maybe not. But with time might come understanding. Now the reason most Sci-Fi takes the near-Human route is simply that Humans have a hard time accepting something that is scary and grotesque. The "uncanny valley" means the aliens need to be almost Human, but not so Human that it makes us uncomfortable to think of them as aliens. So they add horns, and head tentacles. The movie Aliens, on the other hand, goes the survival horror route. The Xenomorphs in those stories are almost demonic. They have these large, elongated heads, a mouth with another mouth in it, exaggerated extremities and a spear for a tail. They're intended to evoke fear instead of wonder. I'm not a fan of the Aliens or Predator movies. I am a huge fan of Star Wars and Mass Effect. But I don't think either one is necessarily better than the other. They both take very different, but still viable, approaches to what aliens might be like. They both have issues with consistency, and they both have things in them that I don't like. Of course, you seem to be forgetting the Big Dental Patient who was extremely Human-like and the fact that he sent a distress signal that the Humans could understand and follow. Speaking about the xenomorphs in the Alien series they were actually designed by H.R. 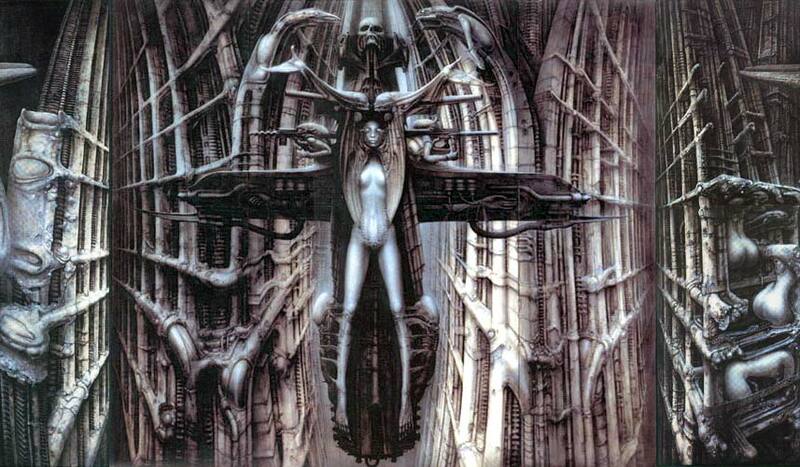 Giger, a famous artist from Switzerland, who's paintings are full of dark, obsuce and erotical elements. A "hollywood" filmmaker would not even be able the imagine such horrors like this man. Scary and fascinating at once. I read a Ray Bradbury novel from a decade or more ago called "The Alien Years" I think. I which aliens show up and dominate the Earth for a while, then they go away. I didn't really care about the human characters but the aliens stuck with me for being really alien. They never communicated with humanity, built these big cities with weird elaborate machines and ruthlessly destroyed anyone who tried to attack them, then they just packed up and left one day for no apparent reason, the motivations are never explained and no one knows what they were doing. I kind of follow HP Lovecrafts philosophy of aliens in that they will likely be so nonhuman that their thought processes are just not something we can understand with any degree of certainty, aside from the basic survival instincts that most living creatures have. I'm a role player and I recall something that happened years ago. We were playing Iron Crowns Middle Earth RPG and well it suddenly dawned on me that our party was looped...we could not hide (being 2 noldor elves and a high man) in the local population. After that I said...hmmm..ok from now on you play humans since at the end of the day you are a human and pretty much don't know what a (insert fantasy race) would be like anyway. I admit that I don't always do the human thing but for the most part I do. And the same thing applies to most aliens in SF books and especially movies or games. They are written by humans, they are unconsiously perhaps going to be human. If you look at the Greeks they created a mythology and theology around very human dieties. I think that the typical SF author is rather constrained to write about aliens as "some aspect of humanity." Where I object is when they don't follow through on it. Take Assari that live for 1500 years...50,000 year (the time since the last reaper invasion) is only 100 generations (if a generation is roughtly 500 years)...that isn't that far back in their history as such. As it turns out they were covering up a lot...so it is good that the Bioware people acknowledged this. Still it is hard to think about how a race that lived that long would view things. Elves in D&D are treated as if by a child...1st level elves are over a hundred years old but no better than a 16-20 year old human? Is the race mentally retarded? Nothing much else explains it. David Gerrold wrote a series of book (unfinished so far as I know) the "War against the Chtoorh" and I thought that was well done (outside of the main character who was just a bit to esoteric for me) where the alien invasion is experienced but never explained. I think there is room for aliens that are lovecraftian in their alienness and aliens that don't look like us but behave in a "human" fashion. But that has to be done in the context of your universe...and they should not be so human that they are basically a human dipped in paint. A good author should have at least a few "gotcha's" over how the alien behave and where thinking that they are just blue humans gets you and the humans in the book in an interesting situation. Star Wars and most other modern SF movies (or series) should be viewed somewhat as using aliens to reflect something on humans that you could otherwise not so easily show...at least without generating controversy. But it still should be well done, which is something that tends to get forgotten as CGI and special effects improve. These two things don't make a SF or Fantasy movie in and of themselves they only add to the immersion. You need a good story, with believable characters...which means believably alien aliens. Unfortunately for SF writers that is to a large extent like a blind man discussing pink. It is very hard to get your head into something alien. It is very hard to get your head into something alien. If it were any other way, it wouldn't be alien.